A new £5m Scottish film studio complex could be built on the outskirts of Cumbernauld next year. 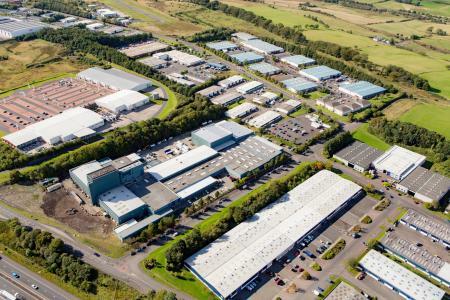 Wardpark Studios, in an industrial site near the M80, has been the home of the first two series of the Outlander US TV series and is now set to expand with funding from the public purse. Terry Thomson, chairman and owner of the studios, is to submit a planning application to expand facilities with a new 30,000 square feet sound stage building with a 50ft ceiling next to the existing site. The plan is being backed by £4m in public money, with £1.5m in grant from Scottish Enterprise and £2.5m in the form of a loan. However, Mr Thomson said that the building of the new sound stage, which can be divided into two and would take the Wardpark facility to six possible stages of nearly 80,000 square feet, would depend on the demand for studio space in Scotland. The planning permission, to be sought from North Lanarkshire council, is the first major announcement by the Film Studio Delivery Group (FSDG) since it was established by the Scottish Government, Scottish Enterprise and Creative Scotland three years ago. Mr Thomson said the new studio space, to be built on a parking lot next to the existing studios, would greatly expand the offer of Wardpark to film producers. Scottish Enterprise believe the status of the public money given to the project would not breach crucial EU 'state aid' rules. Allan McQuade, director of business infrastructure at SE, said the state aid situation was "robust". A separate, wholly private £140m bid to build a large studio complex in Straiton, on the edge of Edinburgh, is currently having its planning permission considered by Scottish ministers. Wardpark believe that they already have a substantial studio complex built in Scotland - insured at being worth £35m - and this new development is just another stage of the work they have already done. Terry Thomson, chairman of Wardpark Studios, said: "What we have been doing in the last two years is what Scots do best - getting on and getting it done. "In Wardpark we have four sound stages, six editing rooms, props stores, construction workshops, dye rooms - Scotland has a permanent film studio, now. "We've been very quiet but we have been creating Wardpark studios in the last two years. Scotland has a film studio today." The existing four sound stages and the rest of the main building are being fully used by the Outlander production. What is being planned now is work in two phases - the creation of a new car park first, and then the building of a new sound stage. However, Mr Thomson said the decision on building the new stage would be made later this year, when he - with advice from Creative Scotland - decides whether there is enough demand. If he receives planning permission from North Lanarkshire he will begin phase one - building the new car park to replace the current one on which the new sound stage would be built - this summer. Mr Thomson does not yet know whether Outlander, and its producers Leftbank Pictures and Sony, wish to remain using Wardpark for series 3. He added: "If series 2 is a great success and they want to come back for series three, we would welcome them with open arms and we hope Scotland would do the same." Mr Thomson said he gets companies looking for studio space about once a week. David Smith, director of Creative Industries at Scottish Enterprise said its commitment has been "unwavering and we want this to happen as much as many in the industry do - it may seem obvious, but I want to put that on the record. "We have done a lot behind the scenes in the last two, two and a half years." "What is significant about this week is that we have reached the stage where it is imperative to move forward with a planning application, which means in short that Wardpark [Studio] can go public with their plans." Fiona Hyslop, culture secretary, has formally announced the plans to the Scottish Parliament’s Economy, Energy and Tourism Committee. The FSDG has also confirmed that conversations are also underway with "potential private sector investors in relation to additional studio sites in Scotland, and the group remains keen to hear new proposals." This week Creative Scotland has also confirmed it has made its first conditional offers from its new £1.75m Production Growth Fund. Totalling more than £800,000, these offers will support two productions to film in Scotland. A third application to the Production Growth Fund is currently under consideration. Ms Hyslop said: "Wardpark Studios Limited’s decision to seek planning consent for new studio facilities in Cumbernauld marks an important milestone in our work to strengthen the Scottish screen sector." Jim Logue, leader of North Lanarkshire council, has welcomed the Wardpark Studios’ development proposal. He said: "The scale of the hoped for expansion at the Wardpark Studios presents a tremendous opportunity for Cumbernauld and North Lanarkshire. "We are, potentially, looking at hundreds of jobs and tens of millions of pounds pumped into the local economy over the next two decades. "On a single day, as many as 300 people could be working on site. "We have already been working closely with the studio owner and have built a strong relationship. "For all the glamour of a film and TV production facility on our doorstep, the reality is in the number of tradesmen and women who will benefit; electricians, painters, plasterers and joiners before we even think about the specialist technical roles associated with a studio. "North Lanarkshire enjoys tremendous transport and communications links which film and TV can only benefit from." Natalie Usher, Creative Scotland’s Director of Screen said: "In order to support local productions and attract UK and international productions, Scotland needs a full range of options for stage space and production offices: purpose-built studio facilities; full-time conversions such as the space currently used by Outlander at Wardpark; and build space like The Pyramids in Bathgate, and the Pelamis Building in Leith. "Converted and build space in Scotland that is currently being marketed compares favourably with similar space marketed by other UK nations, but we also need purpose-built space in order to compete effectively. "We are working through the FSDG to realise a purpose-built studio facility in addition to the existing full time converted space at Wardpark. "We continue to investigate other potential options where there is interest from the market and appetite from private investors." Mr Smith added: "A huge amount of work has been going on behind the scenes since we published the feasibility report and invited the private sector to submit their proposals. "We’re really excited about the ambition Wardpark Studios has for the site and we’ve been working with them on various iterations of their business plan to secure further investment in Scotland’s screen infrastructure. "The company’s plans remain at a critical stage of consideration. "But I believe Wardpark Studios’ decision to apply for planning consent to increase the size and scale of the existing facilities in Cumbernauld illustrates their long-term commitment to operate world-class studio facilities in Scotland.